In medium bowl, combine flour and seasoned salt; mix well. Add beef pieces; turn to coat. Spray large nonstick skillet with nonstick cooking spray. Heat over medium-high heat until hot. Add beef; cook 5 to 6 minutes or until browned on both sides. Meanwhile, add tomatoes and water to any remaining flour mixture; mix well. 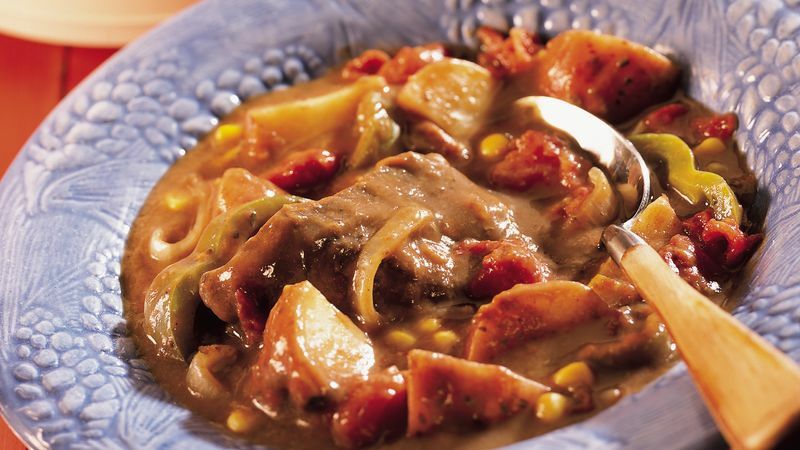 In 3 1/2 to 4-quart slow cooker, layer potatoes, browned beef, onion and bell pepper. Pour tomato mixture over top. Add corn; mix well. Cover; cook an additional 15 to 30 minutes or until corn is tender. If desired, add salt and pepper to taste. Pull a step stool over to the sink and put the potatoes into a bowl of cold water. Have children scrub the spuds with a vegetable brush.